Indian fisherman says US Navy opened fire without warning in Monday's deadly incident in the Persian Gulf. An Indian fisherman on Wednesday said the US Navy failed to warn the vessel on which he was sailing in the Persian Gulf before opening fire. One Indian was killed and three others were wounded Monday when the US Navy refueling ship fired on the fishing vessel. 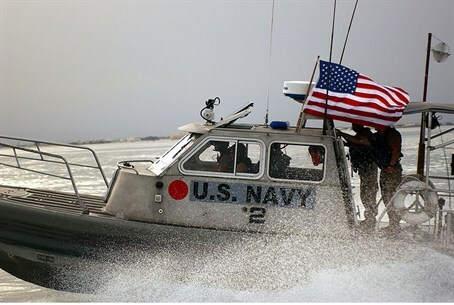 US officials maintain the small boat ignored repeated warnings and rapidly approached the US vessel in a region where tensions between Iran, the US, and Washington's Gulf Arab allies are running high. Indian Foreign Minister S.M. Krishna said Tuesday it was unfortunate that a fisherman was killed in the incident. Krishna said his government is in contact with India's ambassadors in Washington and Dubai and that the United Arab Emirates is investigating the incident. The United States has been expanding its forces in the Gulf as it seeks to increase pressure on Iran over its disputed nuclear program. On Tuesday, Iran – who has threatened to close the vital Strait of Hormuz at the mouth of the Persian Gulf amid crippling Western sanctions aimed at halting Tehran's nuclear weapons program – said the recent shooting incident showed that foreign forces threaten regional security.